Four films looks at those wave-riding polar bears for whom ice and weather is no barrier to finding the perfect wave. Directed by Andrew Wyton. USA. 2016. 4 min. A short film about Great Lake surfing. Directed by Ben Weiland. USA. 2015. 25 min. In the middle of the North Atlantic, a cluster of 18 jagged islands comprises the Faroe Islands. Dane Gudauskas, Justin Quintal, Sam Hammer, Tyler Warren, Chris Burkard, and Ben Weiland attempt to unravel a coastline of dramatic fjords and plunging waterfalls in search of perfect waves. They spend two weeks exploring the islands, living in seaside cottages and becoming acquainted with stunning scenery and the strange and ancient customs of a nation founded by Vikings. Starring Chris Burkard, Dane Gudauskas, Sam Hammer, Tyler Warren, Justin Quintal & Elli Thor Magnussen. Directed by Ryan Mattick. Australia. 2015. 22 min. On this lightly frosted, absurd ten-night surf trip with a twist, an unlikely trio chase the wild crest to the coldest corners of the earth. Starring Garrett Parkes, James Kates & Chayne Simpson. Directed by Rob Lockyear & Jeremy Joyce. UK / Iceland. 2015. 22 min. 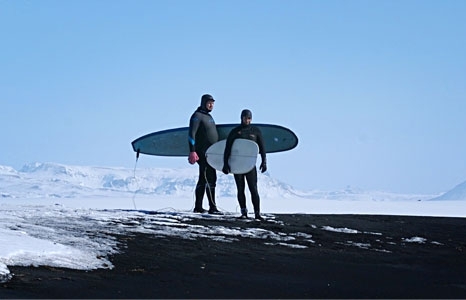 Two friends brave snowstorms, eccentric locals, and each other as they travel through Iceland to find a perfect wave they spotted in an old photograph.